Can Tech Talent Help New Bands Thrive? 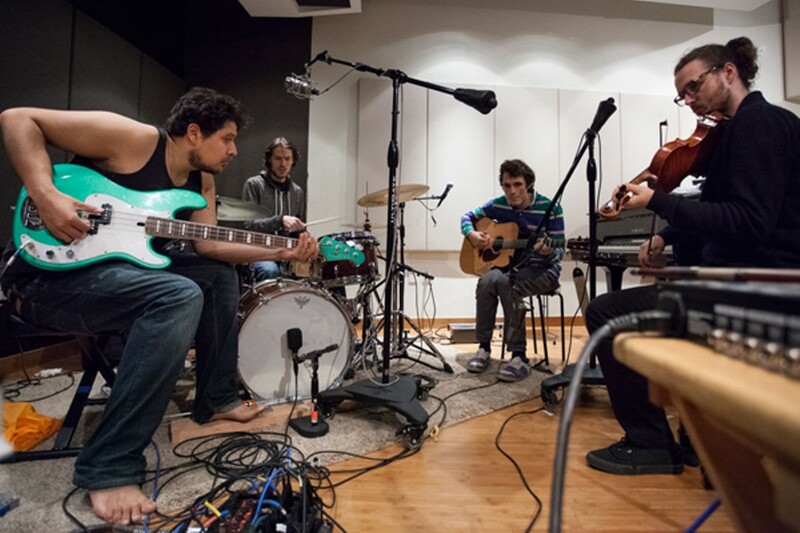 The Boston Boys said their session at Zoo Labs felt like an accelerated MBA program. Applications for the residency are available at zoolabs.slideroom.com. Visit zoolabs.org and facebook.com/TheZooCommunity for more information. At the South by Southwest music festival last year, The Boston Boys, a band made up of four Berklee College of Music graduates, started to doubt whether it could find its place in the increasingly challenging music industry. "We're playing random showcases all around town," recalled Eric Robertson, mandolin player and vocalist for the group. "We felt like, 'What's missing? What are we doing wrong?'" The underlying question was one that is familiar to any new band trying to stand out in a sea of up-and-coming groups: Could they survive as working musicians? Today, all four members of The Boston Boys — a group that calls its genre "future roots" — are dedicated to music full-time, and making a decent living, too. The Brooklyn-based group credits its success, in part, to a trip last fall to West Oakland where it participated in the first-ever residency program of Zoo Labs, a new East Bay nonprofit. The Zoo Labs Music Residency, which is now accepting a second round of applications, is a two-week intensive program that gives a team of collaborators an opportunity to record new music, participate in workshops, and build a long-term business strategy. The concept is loosely based on the model of tech incubators like Y Combinator, which supports startups by providing early funding along with intensive training and networking in Silicon Valley. Zoo Labs offers a hybrid between the traditional artist residencies and the emerging tech accelerators, explained Vinitha Watson, co-founder and executive director of the organization. "We are looking at expanding the middle class of musicians," said Watson, who lives in Oakland with her husband David Watson, another Zoo Labs co-founder. "It's about how to sustain doing what you love — being able to support yourself and your family." Watson and her husband are both former Google employees, now working in the music sector. Vinitha, who helped set up Google's first India headquarters in 2003, has a background as a singer and dancer, specializing in South Indian styles. David, who previously worked as a software engineer for Google, is now a full-time music producer. The third co-founder of Zoo Labs is Anna Acquistapace, a Berkeley native and design strategist who has done consulting for high-profile clients such as Samsung and Nike. The two-week program targets "entrepreneurial music-making teams," as Zoo Labs describes it. These teams can be groups of three to five people who make and produce music together in some capacity (whether a band on its own, a single artist and his or her producer and manager, or a group of musicians and a videographer, etc.). The application involves a questionnaire, a project proposal, a one-minute video pitch, and a sampling of past musical projects. The next deadline is January 15, after which point Zoo Labs will choose one winning team that will complete its residency — which will be tailored specifically to the group and its individual goals — in March. Aside from travel to Oakland, all expenses are covered by Zoo Labs, including housing onsite with access to a living area, kitchen, showers, gym, and a garden. The facility features a 1,200-square-foot studio space with a live room for recording, control room (with a 48-channel SSL Duality mixing board), two isolation booths, and a wide range of instruments and recording equipment. During the two weeks, "we give them basically all the support that they need," explained Vinitha Watson. 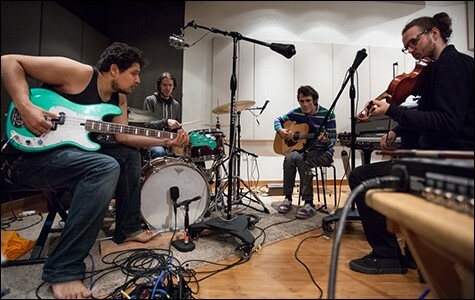 The group participates in a series of workshops and classes with guest professors, consultants, and music and tech industry experts, in addition to recording at least three songs during the program. Artists retain ownership rights on songs produced during the residency and Zoo Labs acts as publishing administrator of the songs with rights to 10 percent commission. Any generated income is reinvested into the nonprofit program, Watson said. "It's a fully immersive program," said Damien Lewis, a Grammy-nominated Bay Area music producer and engineer who worked as the recording engineer, co-producer, and mixer for the first Zoo Labs residency with The Boston Boys. "It's like moving to China and learning to speak Chinese. I've never seen anything like it before." Grants and private donors — many who work at tech companies like Google and Facebook — provide the main source of funding for the residency, which costs about $20,000. Those funders also support several other Zoo Labs programs separate from the residency, including a "startup lab" co-working space on site for businesses that pay monthly memberships. It is also in the process of launching a "beat lab," which will make studio space and equipment available to producers who pay monthly fees. Zoo Labs plans to offer the two-week residency three times a year. "With the music industry going into this no man's land, what we call the Wild West ... we realized there needed to be some sort of support system," Vinitha said. "The residency was really born out of this need to give artists a creative space to do their thing, and, on top of that, give them strategic business and design classes to be able to propel their product forward." For The Boston Boys, the experience was transformative, said band manager Ben Baron, noting that it felt like all five of them received an MBA in just two weeks. "We deconstructed who we are and we rebuilt it with a strategy. ... It accelerated our career by a whole year." Baron reflected on the program during a Skype interview from Morocco, where the band is currently touring as part of a collaboration between the US State Department and the US Embassy in Morocco. Since 2012, The Boston Boys have performed in countries around the globe — including Egypt, Israel, Saudi Arabia, Belarus, and Montenegro — funded by a State Department exchange program. During the residency in Oakland, The Boston Boys solidified a strategic plan to expand on these kinds of partnerships, which often involve educational workshops. The band is now working on a curriculum it can bring to American schools, Baron said. The hope is that school gigs will be a key source of revenue to supplement The Boston Boys' traditional performance gigs, Baron said. "This is a business. I think bands make the mistake of saying they just want to focus on the music. But companies don't just focus on their products." The residency shifted the way The Boston Boys approach the business side of the band, added Robertson, 24. "It was something we were thinking about all the time, but something we were intimidated by. [At the Zoo], it's something we became excited about. It was like, 'Wow, this is an opportunity.'" Baron said that one comment David Watson made to him, in a discussion about new models of music distribution, has stayed with him since the program: "If you're just 'new,' you've already got barriers to entry. The major players are mobilizing against you. You need to be new new, where no one else exists. ... The Zoo asked us to speak in those terms and I think that was incredibly special." It's clear that tech innovation in the music industry is critical, said Vinitha Watson. She noted that, for new bands, "I'll venture to say the album is dead. It's too expensive to make an EP." That means that songs are nothing more than a marketing tool or business card. "And if that's your business card, then what's your business?" Once musicians start to think of entrepreneurship as a creative process just like songwriting and performing, they realize both goals are aligned, she said. "Programming, like creating music, is very creative. We are trying to bring these worlds together in a very concrete way." Lewis, who has collaborated with pop stars such as Katy Perry, Rihanna, and Mariah Carey, said he regularly encounters talented artists who struggle with basic business and promotion responsibilities that are now a standard part of being a musician. "In the past, you were expected to practice your instrument, write great songs, and play gigs," he said, noting that technology has leveled the playing field. "The bands that are successful, it's usually because one or several of them are very business-savvy." Having an opportunity to focus exclusively on your band for two weeks — both by making music and building a business strategy — is thus very valuable, Lewis added. "To get a block of time to work on music and be completely dedicated to it, to turn off your cellphone and be fully engaged in the process, that's super powerful."